Jim Follum (left) and John Pierre accept their Best of the Best Conference Paper Award. 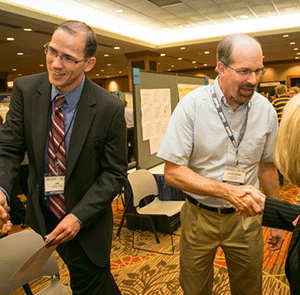 Power Systems Research Engineer Jim Follum, Electricity Infrastructure, and his collaborator John Pierre, an Electrical and Computer Engineering professor at the University of Wyoming, received a Best of the Best Conference Paper Award at the 2015 Power & Energy Society (PES) General Meeting. Their paper, Time-Localization of Forced Oscillations in Power Systems, proposes a time-localization algorithm for detecting forced oscillations, and it was chosen along with three others from a total of 1,600 submissions. Follum and Pierre's paper was selected by the Power System Dynamic Performance Committee. Each paper was judged on technical merit and presentation quality, and the winning submissions were announced at the PES General Meeting Awards Dinner in July. Having joined PNNL in 2014, Follum's research focuses on the application of statistical signal processing theory to power grid measurements. Recent efforts include the detection of forced oscillations and the identification of abnormal power grid conditions using synchrophasor data.